The update contains both stringed and percussion instruments. 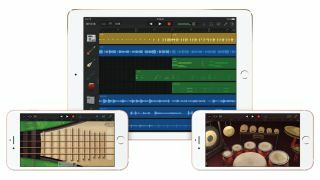 With Apple seemingly on a mission to make inroads into the lucrative Chinese market, the company has taken the canny step of adding a range of Chinese instruments and musical loops to GarageBand. The update introduces the pipa, erhu and Chinese percussion instruments to the software, as well as 300 Apple-created musical loops. Desktop users also get two new Chinese Live Loops templates and the option to share to popular Chinese social networks QQ and Youku. The new instruments include a number of different articulations for added realism, including rapid picking and note bend for pipa, and trill, grace note and glissando for erhu. If you're using an iOS device these instruments can be played via multitouch, with 3D Touch enabling dynamic control of vibrato and intensity if your hardware supports it. Alternatively, you can let GarageBand do the playing legwork by engaging the Autoplay feature. The supplied percussion instruments include drums, woodblocks, cymbals and gongs, while the new loops run across a variety of instruments and styles, including guzheng, dizi, yangqin and Peking Opera. As well as the new sound content, a number of Chinese localisation features have also been added. The GarageBand updates are available now (2.1.1 for iOS and 10.1.2 for Mac) and are free for existing users. If you need to buy the app it's available for £3.99 from the iOS and Mac App Stores. Users in Greater China will see these new features by default on iOS and OS X after updating. Outside of Greater China, these new features are visible by default on OS X and can be enabled on iOS devices in the advanced settings menu.